I promised you pictures and I have pictures! I'm sorry for making everyone wait so long but it seems that my body decided it was going to sleep in some this morning. No worries, though. I'm obviously awake now and I have all of the pictures downloaded off of the camera and ready to go right here onto the blog! So, without more of me babbling...here are the photos! Photo #1: From the doorway, looking in on the two desks. The two pieces of paper you see are actually my work space. I do a lot of stamping and this protects the table cloth. Photo #2: Welcome to the tech table. As you can see, it holds my pazzles, scanner, stereo and just to the left is my printer. 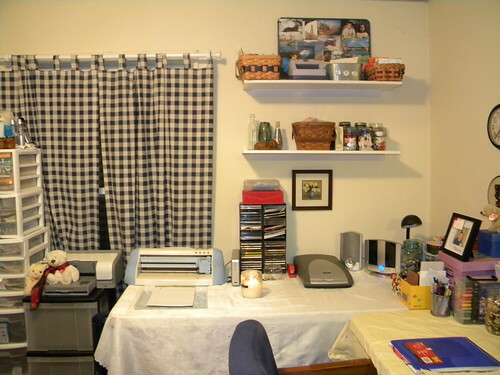 Above the table are two shelves, holding craft supplies and other things that make me smile. 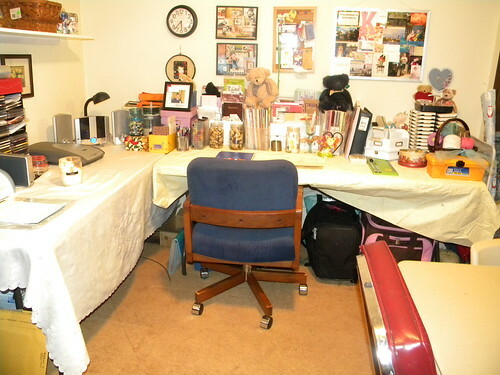 Photo #3: This is the PC corner. 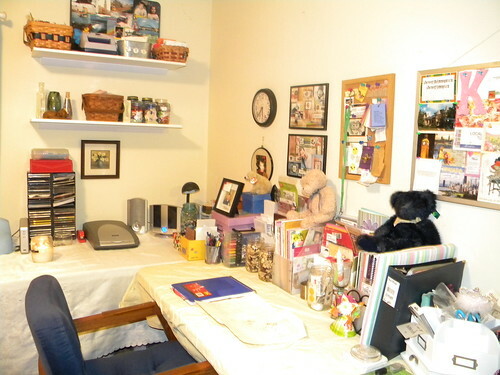 The tote and containers to the left of the desk are holding office supplies and some smaller scrapbooking albums and supplies. Photo #4: This is to the left of the desk area. The box on the floor is full of wall hangings. It has my certificates from college, some photos and other hangings. The reason that it's still sitting in the room is that it's too heavy for me to move out! Some of those frames are darned heavy. As I find places for them to be hung, I'll take them from the box. When the box is light enough for me to move, I'll move it out! 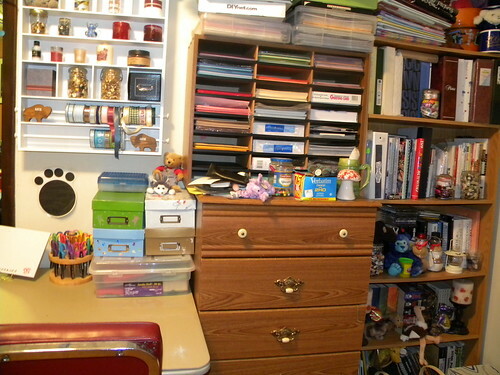 Photo #5: Here you can see my bookshelf, dresser and part of the boys craft table.I just realized I need to tidy up on top of the dresser, but have no fear.. I'll do that as soon as I hit post on this. 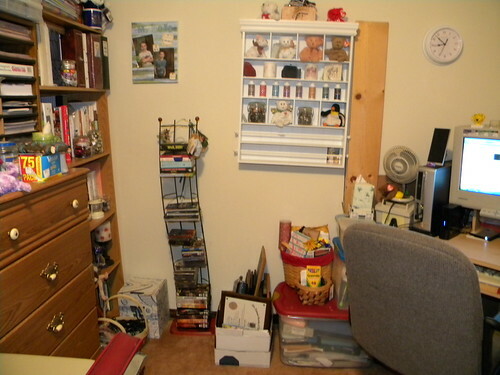 You can just see the handles of the two baskets that are on the floor in front of the bookshelf. One is holding all of the cables and cords that I found. I still have electronics in a box in the laundry room, but once I"m sure we don't need these, out the door they will go. The containers on top of the paper sorter hold 12x12 papers and the albums on top of the bookshelf are empty and waiting to be filled. Photo #6: Another shot of the tech desk area. 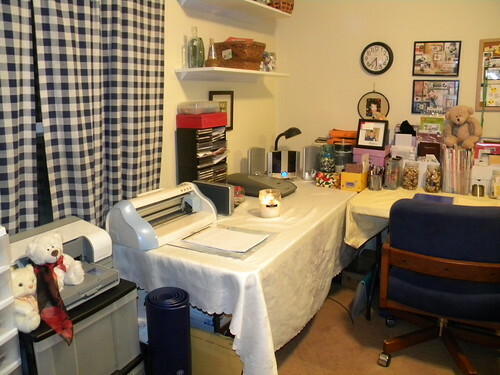 Photo #7: One last look towards my craft table. As you can see, I have my craft bags stored under one end of the table. And that's it! It's done! I'm so excited! I know there's more purging to come but I am in love with this room right now so I'm going to enjoy it. 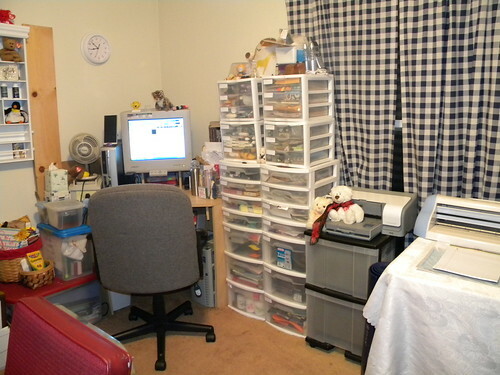 I am so freaking jealous of that paper organizer/sorter thingie you have. Where on earth did you get it?